Game-time footage has long given sporting teams an edge when preparing for contests and improving technique. Sailing is a sport in which drones can redefine the methods by which crews advance skills and boat performance. Defined as any remote controlled aircraft, drones were previously accessible only to military and scientific organizations. Concerns over safety and inexperienced pilots are fueling a debate over the introduction of drones into national airspace. Regardless of recent controversy surrounding these small battery powered aircraft, their cameras can provide transformational perspectives to the sailing world. Experienced pilots operate drones within close range of sailboats at speeds up to 30 knots while capturing a previously impossible viewpoint. Drones add significant value in racing applications, providing an intimate and revealing view for sailors. Teams can analyze starts, crew positioning and reaction, mark roundings, sail trim, tacking and boat handling from an angle that shows crew, sail, and boat position. The elevated vantage points are near-range, which is optimal to observe both fine detail of crew operations, while removed enough to observe the course and other boats. Reviewing high definition video recorded by drone allows crews to see their actions precipitate within the larger context of a race. Hull speed, wind direction, and GPS coordinates can be overlaid onto video, enabling precise analysis of all racing parameters. Video is shot up to 100 frames per second – if additional detail is required, up to 6,000 still images can be extracted from one minute of video. listed yachts in a range of settings. 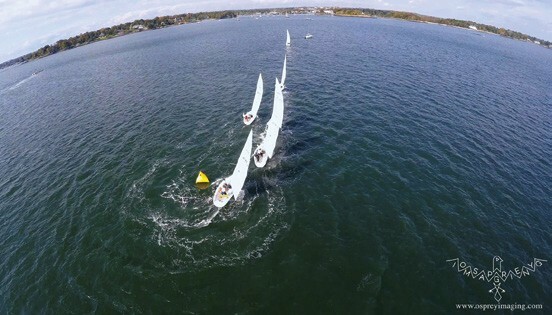 Yacht clubs utilize drones to document events for record, awards, distribution, and promotion. Osprey Imaging’s team has logged over one thousand hours flying drones, and have an extensive record of working with the sailing community. Fully insured and experienced in a wide range of operations, we set ourselves apart through our ability to fly in challenging environments. As aviators and sailors, we are experts in flying to capture action in detail. Real-time high definition monitoring enables our pilot to see the aircraft’s first person view and the photographer to operate the camera with extreme precision, at a range of up to one and a half miles. Our fleet is comprised of four-, six-, and eight-rotor copters, which we use for various purposes. 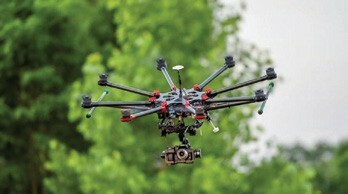 For close range observation, an agile drone outfitted with a high-resolution camera is preferred. Our largest drone is capable of lifting heavy cinema grade cameras. Osprey Imaging complies with FAA regulations to avoid disturbing air traffic and the general public. Safety is our primary consideration in all flight operations, which is why we constantly review weather conditions and potential hazards, and have established an emergency procedure to minimize operational risk. We are professional videographers with experience documenting regattas and showcasing vessels and yacht clubs. Though we are based in Western Long Island Sound, the mobility of our aircraft gives us global reach. We invite you to visit our website at ospreyimaging.com to view our portfolio of work, and please contact us if you would like to discuss how we capture photography and cinematography.